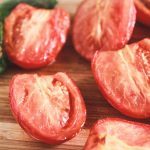 Sweet, juicy tomatoes are given a savory twist with a little bit of grill time to make delicious smoked tomatoes. Eat them as-is or combine them with crackers and cheese for a truly delectable treat! Cut each tomato in half. Brush the open side of each tomato half with olive oil and sprinkle with sea salt. Fill a chimney starter just less than 1/3 full with charcoal briquettes. You should have just barely more than one layer of coals. When the coals are heated up, add them to the grill next to the drip pan, and then close the lid. Allow the grill to come up to about 250 degrees Fahrenheit. Place the cooking grate in your grill and then place the tomatoes on the grate, over top of the drip pan. The tomatoes should not be over top of the charcoal briquettes. Add one small chunk of hickory or applewood directly to the coals. Close the lid on the grill and cook the tomatoes for 45 minutes to 1 hour, until they are soft enough to pierce with a fork. We use large wood chunks instead of chips for our smoking. If you are using wood chips, make sure to soak them first, and follow the instructions on the package for placing them in your grill. For gas grills, you can use one burner on low and place your tomatoes on the upper rack of the grill. You may want to rotate your tomatoes on the rack every 30 minutes or so. It can take 2 to 3 hours to smoke tomatoes this way on a gas grill. Err on the light side for your wood. We've made the mistake of putting too much wood in with our tomatoes every now and then, and they end up far too strong. You are just looking for a hint of smoke to compliment your tomatoes.